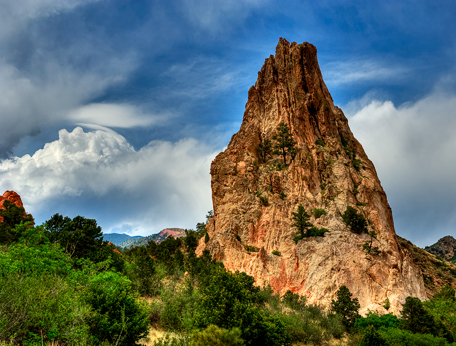 Colorado Springs offers great landscapes and hiking trails. 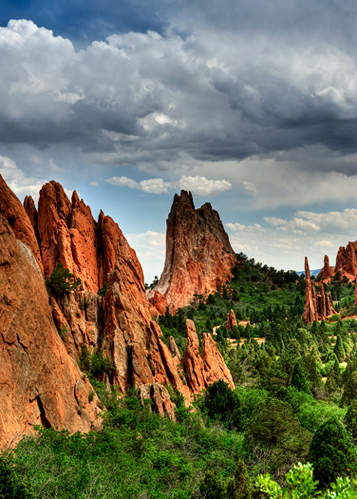 The Garden of the Gods is a tourist trap but it showcases breath taking large twisted red rock formations. The garden was dedicated in 1909 as a free city park. An abundance of plant and animal life can be found throughout its 1350 acres, as well as the magnificent red sandstone rock formations that have made it world famous. Many of these formations are over 300 million years old and were sculpted through time by erosion. 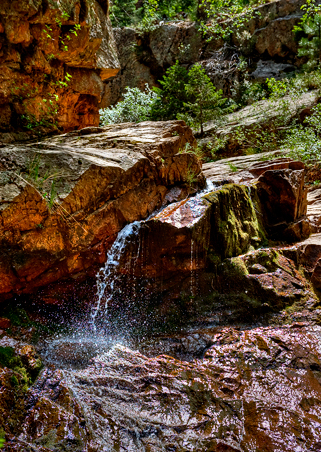 Nearby Seven Falls cascades down 181 feet over seven steps of granite cliffs. I tromped up 224 steps along the falls that lead to two miles of wildlife watching nature trails. The additional short and scenic route to Midnight Falls. Midnight Falls is pictured below. It was idyllic and peaceful to listen and ponder this wonder of nature.